This delightful Apple Frangipane Tart combines buttery crisp pastry with a sweet almond cream and lightly sweetened apples. It is a free form tart which means it does not use a tart pan. The ends of the pastry are simply folded up and over the apples, acting as a shell to hold everything together. This dessert is lovely in the Fall when newly harvested apples are available at farmer's markets. Serve warm from the oven or at room temperature, with or without a dollop of sweet whipped cream or vanilla ice cream. My favorite pie crust to use for this tart is Pate Brisee, which is a French short crust pastry made from a mixture of flour, sugar, salt, unsalted butter, and ice water. It is well suited for this free form tart as it has a high ratio of fat to flour which gives the pastry its crumbly texture and buttery flavor. Frangipane is a sweet almond filling made with ground almonds along with sugar, butter, and eggs. You can use either blanched or natural almonds or you can just buy almond meal (flour) at health food stores or some grocery stores. Once made, the frangipane is spread over the unbaked pie crust which adds a wonderful flavor but it also acts as a shield to prevent the apple juices from penetrating into the crust. Sliced apples are then arranged over the almond cream and the edges of the pastry are folded up and over the filling. The assembled tart is then brushed with a little cream, and sprinkled with sugar, which only adds to this pastry's crisp and crumbly texture. Bake until the crust is golden brown and the apples are tender, but not mushy. Apples are one of the more versatile fruits that are enjoyed both in baking and eating out of hand. Fortunately there is an apple for everyone as varieties number in the thousands and run the gamut from very sweet to very tart with textures from soft to firm. In baking, it is important to use the right type of apple i.e. one that retains its shape when baked. 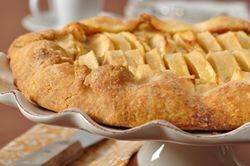 Oftentimes recipes call for Granny Smith Apples and this is because they are readily available year round and their tart flavor and firm texture make them ideal in pies and tarts. But if you are fortunate enough to live near an apple orchard or can go to a farmer's market, your choice of suitable baking apples dramatically increases. There are so many varieties with wonderful textures and flavors that are never sold at your local grocery stores. In my area Mutsu Golden, Rome, Stayman Winesap, Granny Smith, Arkansas Black, Jonagold and Jonathan are available but try the varieties locally grown in your area. You won't be disappointed and even try mixing two or even three varieties for a more complex flavored tart. Frangipane: In your food processor, place the almonds, sugar, and flour. Process until finely ground. Then add the rest of the ingredients and process until you have a smooth paste. Transfer to a small bowl, cover and refrigerate. Pour 1/8 cup (30 ml) water in a slow, steady stream through the feed tube until the pastry just holds together when pinched. Add remaining water, if necessary. Turn the pastry out onto your work surface, gather it into a ball, cover with plastic wrap, and refrigerate for about one hour or until firm. Once the pastry has chilled sufficiently, remove from refrigerator and place on a lightly floured surface. Roll the pastry into a 12 inch (30 cm) circle. Transfer to a parchment lined baking sheet. Cover with plastic wrap and place in the refrigerator while you prepare the apples. Preheat oven to 375 degrees F (190 degrees C) and place the rack in the center of the oven. Assemble Tart: Remove the chilled pastry from the refrigerator and spread the frangipane evenly over the crust, leaving a 2 inch (5 cm) border. Arrange the apple slices evenly over the frangipane layer (concentrically or free form), again leaving a 2 inch (5 cm) border. Fold the border of pastry up and over the apples (sealing any cracks) and brush the pastry crust with a little cream. Sprinkle about 2 tablespoons (30 grams) of sugar (depending on tartness of the apples) over the crust and apples. Bake the tart for 50 to 60 minutes or until the apples are tender and the crust is golden brown. (The apples should be soft, but not mushy, when pierced with a knife.) Remove from oven and place on a wire rack to cool. Serve warm or at room temperature with vanilla ice cream or softly whipped cream. Refrigerate any leftovers.